What Dead Men Don't Wear. Remember this fabric? 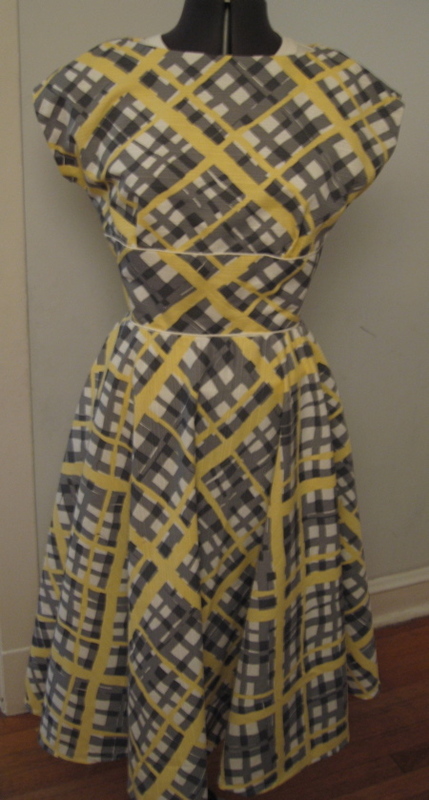 And this pattern, which I made into this dress? Well, I didn't have enough of the car fabric (damn directional print!) so I thought, oh! PLAID! Of COURSE! But there was no way in hell that I was going to match a plaid with a large repeat across eight gores, so I put a modified circle skirt on it, instead. I'm not quite sure I did a good enough job on the plaid (it matches PERFECTLY at the BACK, I swear! Across the zipper, and everything!) but it's too late now, and besides, there's piping at the midriff! That should break it up a bit. I have realized, actually, just now, why I am so obsessed with midriff lines — I'm so shortwaisted that breaking it up makes me a bit longer from shoulder to waist. Or, at least, that's the idea. I'm wearing this to give a talk on Saturday. The idea is: if you can't be entertaining, be eye-catching (although, I promise, I am going to try for entertaining, too!). Once, for presenting an academic paper, I wore a BRIGHT green 1960s Jackie O.-style shift and jacket. The jacket had jeweled buttons and I had, by complete coincidence, matching green and white shoes. I remember the outfit in more detail than the paper! What Lydia said. Where did you find this cute plaid? Not Vogue Fabrics…It looks quite vintage. This is so cute, I just want to hug you (if you don’t mind). This dress is so spring too! Ooh! Very springy! And three cheers for the yellow bag! great dress! And I think if you do want to break up the midriff, being slightly not matched in the band is actually better.If we were in the same town, I’d loan you my gray suede wedge loafers just to see the effect…. Beautiful! I, too, am short-torsoed – I tie something around my natural waist any chance I get. Erin, I’m sure you look fabulous, and I love a midriff-band style myself, but it’s always been my understanding that breaking up the length of something will SHORTEN it. In effect, a midriff band, unless it’s sneakily extended, is the technique a LONG-WAISTED woman would use to break up the length of her torso. I expect it flatters you because a fitted torso means that people won’t overlook the fact that you have one, which could happen in a baggy or otherwise unfitted style.I’m not trying to rain on your parade, and I bet it does look good on you, or you wouldn’t like it so much. Just, ordinarily, breaking up the length of the torso isn’t the first thing I’d recommend to someone who’s short-waisted. I swear I have seen a pair of prada heels that uses that exact same plaid pattern! It’s a lovely dress. i like this dress even more in a patterned fabric. i’d love to see it with a contrasting waistband. the piping is lovely! i wouldn’t be able to resist buying matching accessories for it. it looks like fun! Steamy bathrooms are excellent stand-ins for marginal hotel irons, as I’m sure you already know.I like what you did with that dress and fabric. The piping is perfect for the bodice and creates a nice break for the eye.Have fun at your talk. Thank you guys so much! I have to admit it’s a nice confidence-booster for my talk to know that a lot of friendly people on the Internet like my dress. :-)The fabric is from Paron’s — their site is http://www.manhattanfabrics.com. LaBella, you know, you’re probably right. Perhaps what I like about this is that there’s only ONE break, where button-front bodices have one at each button, almost. Hmm. I might have to do a test! Oh, its so cute. I love the piping. Erin thankyou for sharing the place you bought the fabric.Have a great time in your dress. Love it! You’re a genius. And who cares whether the plaid matches exactly or not, as long as it’s comfortable and you love it?! My very first thought upon seeing this dress was “Wow. This is just what Erin has been looking for. She will love it.” Then I learned that it was made by you from a pattern you posted earlier. It is great and I think that it will help you look longer waisted. Looking at the photo, it does not appear that you are noticibly short waisted as some women are. The proportions look good to me. This is such a great dress – you are genuis! Thanks for letting us all see it.